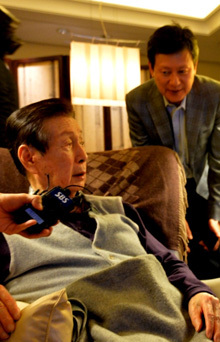 Founder Shin Kyuk-Ho of Lotte Group meets with local South Korean journalists in his office on the 34th floor of Lotte Hotel in downtown Seoul on Oct. 16, 2015 to announce that his successor is his oldest Shin Dong-Joo (seen above). Founder Shin Kyuk-Ho of Lotte Group officially announced that he would support his oldest son Shin Dong-Joo as his successor to lead the retail giant in a press meeting with several journalists in Seoul on Oct. 16, 2015, reported Chosun Ilbo, a mass circulation daily in its online edition on the same day. In his meeting with the local journalists held in his office on the 34th floor of Lotte Hotel downtown Seoul, the 94-year-old Lotte founder made the announcement in front of the local journalists amid the the battle for Lotte Group controlling escalated between his oldest son and his second oldest son, the current Lotte Chairman Shin Dong-Bin. "It is natural that my successor should be my oldest son even according to the traditional customs of both Japan and Korea," Shin was quoted as saying by the local media. "He (Shing Dong-Bin) cannot become my successor and he just stole it from me and my oldest son"
"The same is true with other business groups in the nation" Shin added. "It is so simple matter and I do not understand why there are lots of fuss out there"
Shin went on to mention that he would work for 10 or 20 more years, saying that he is in "very good" health condition. Asked if he would forgive his second oldest son (Shin Dong-Bin) if he apologized to him, he said "Of course I will forgive my son." The press meeting was attended by his oldest son, former Lotte Holdings Vice Chairman Shin Dong-Joo, also known as Hiroyuki Shigemitsu in Japan, and Cho Eun-Ju, wife of Shing Dong-Joo. Several other businesspeople, including his own younger blood brother Shin Sun-Ho, were with the founder at the time of his press meeting on the scene. Last July, the current Lotte Group Chairman Shin Dong-Bin ousted his own father and founder of Lotte Group, Shin Kyuk-Ho, and his older brother Shin Dong-Joo, then Lotte Holdings vice chairman from the Lotte Group as they attempted to strip Shin of his chairmanship. Earlier, the current Lotte Chairman Shin Dong-Bin, also known as Akio Shigemitsu in Japan, ditched his older brother against his father's intention and in his ambition to own and lead the two entities of the Lotte Group in both South Korea and Japan. This incurred the huge wrath of his father. While the founder and the oldest son were fighting against the current chairman to retain the rights to run Lotte Group, the current Chairman Shin and his Lotte Group officials argued in its news release that the founder's thinking ability is unstable because of old age, and that his oldest son is taking advantage of his father. Prior to the press meeting with the journalists on the day, the oldest son demanded that Lotte Group immediately dismantle CCTV keeping an eny on the activities of the founder and stop disgracing the honor of the founder by saying "father is not normal mentally." Earlier the oldest son filed lawsuits against the current Chairman Shin Dong-Bin both in South Korea and in Japan to regain the control of Lotte Group. On Oct. 8, 2015 he held a press conference at Westin Chosun Hotel in Seoul in his efforts to announce the "truth" behind the ugly family feud in which a boardroom coup was committed. “For a long time, Dong-bin and I had our own roles in the company. However, Dong-bin has been greedy, and took over our (Dong-joo and father) roles illegally,” Dong-Joo argued in a statement in the press conference. Due to Shin Dong-Joo's lack of Korean language capability, his wife Cho Eun-Ju read the statement on his behalf in the conference. The founder of Lotte Group, Shin Kyuk-Ho (Japanese name: Takeo Shigemitsu), was born on Oct, 4, 1922. He is a Korean businessman. He has led the Lotte group for nearly six decades until his second oldest son Shin Dong-Bin took it from him recently. Shin founded the Lotte Group in Japan in 1948. He was born in Ulsan, Korea in 1922. When in early 20s Shin went to Japan to study and earn money. Lotte grew from selling chewing gum to children in post-war Japan. It soon became a major multinational corporation with overseas branches in dozens of countries and products shipped worldwide. Lotte is now South Korea's fifth largest business conglomerate. Shin was impressed with Johann Wolfgang von Goethe's The Sorrows of Young Werther (1774) and named his company Lotte after the character Charlotte in the novel.